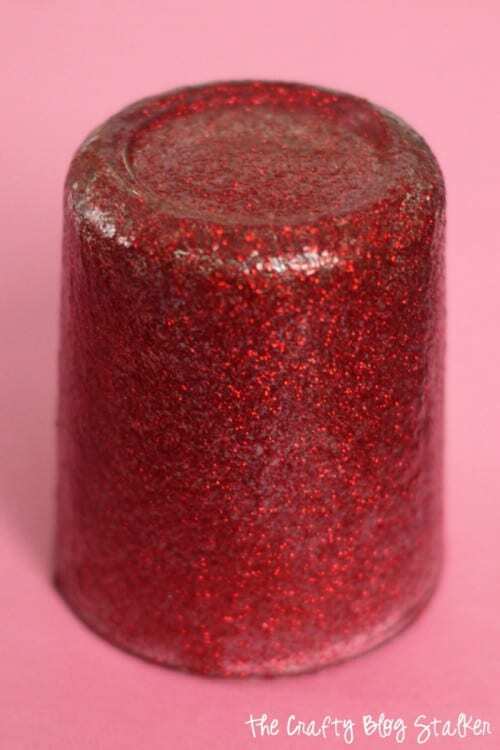 Glitter Votive Candle Holders are a perfect addition to any centerpiece. Great for wedding or home decor. Easy DIY Craft Idea. Video tutorial included! Are you a glitter and sparkle fan? 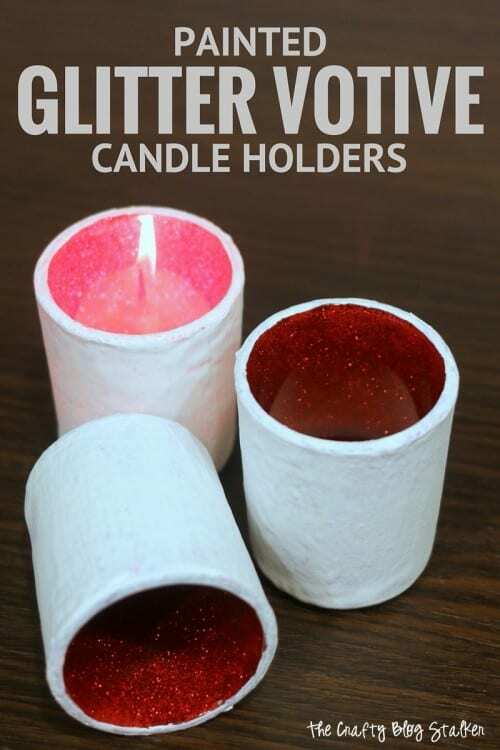 If so, you are going to love these glitter votive candle holders. They are beautiful on their own but add a candle to them and they really shine! You could use this technique on any type of glass like a vase, jars, or home decor pieces. I love that the inside looks glamorous and sparkly while the outside is plain but still beautiful. 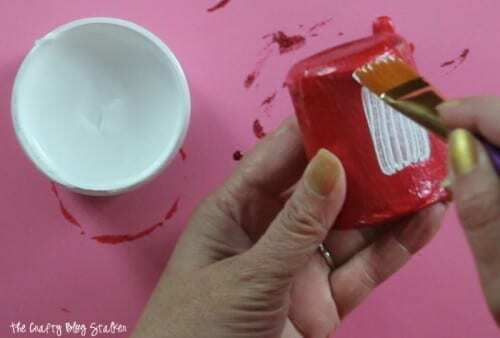 Plus, you don’t need that many supplies and this is a pretty simple craft, although it is not fast because you have to let each layer of paint dry before you add the next coat. I do have a video tutorial if you would prefer to watch the tutorial. If you like my video subscribe to my YouTube Channel so you don’t miss out on any future video tutorials! 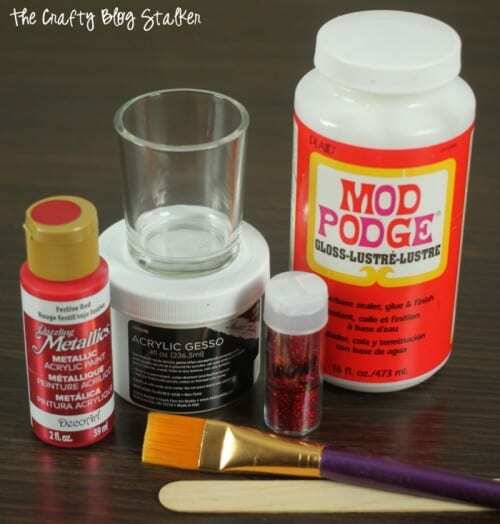 To begin, combine the red glitter and Mod Podge. I don’t have an exact measurement but I would say about equal parts of each to get good coverage. 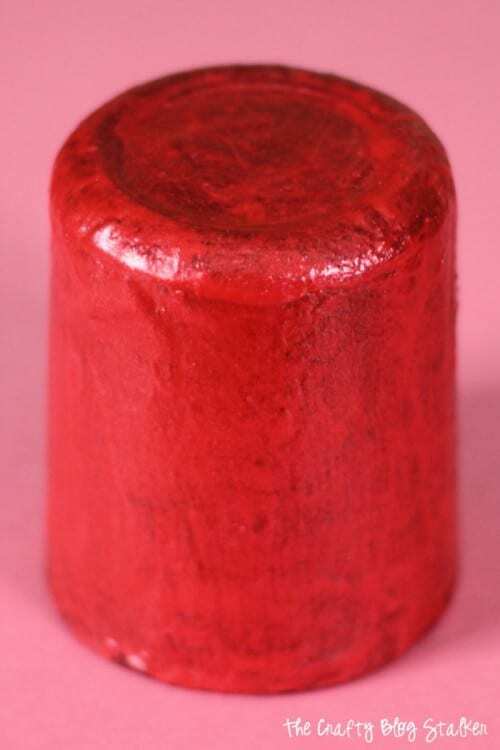 Then simply paint the mixture onto the votive with a paintbrush. I applied 7 coats of the glitter and Mod Podge mixture. You want a majority of the surface to be covered in glitter. Let each coat dry for 10-15 minutes before you add another. The next couple of layers is the Metallic Red Acrylic Paint. This will fill in all of the space that didn’t get covered with glitter. I applied two coats of this paint. When the red paint is dry then it is time to move onto the Gesso. Gesso is a canvas primer used on canvases. It is super thick so it is great to use for this project because it will cover all of the red. Apply two coats with a paintbrush. 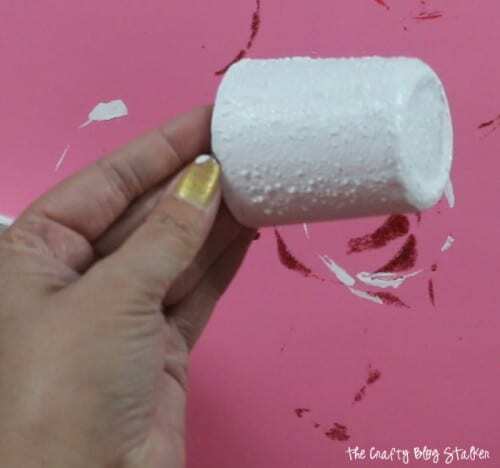 For the third coat, apply with a sponge and tap the votive. It will look kind of pokey, but don’t worry, the paint flattens out as it dries. When the Gesso dries it looks like ceramic. Aren’t they beautiful? 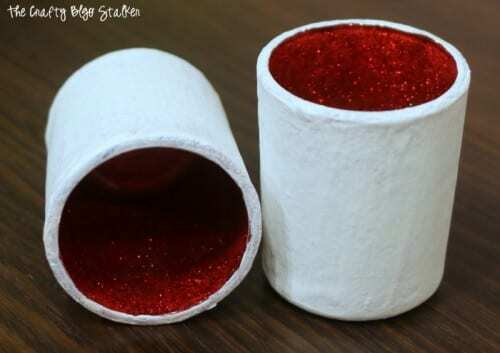 I love seeing all of the red glitter sparkle from behind the white ceramic outside. 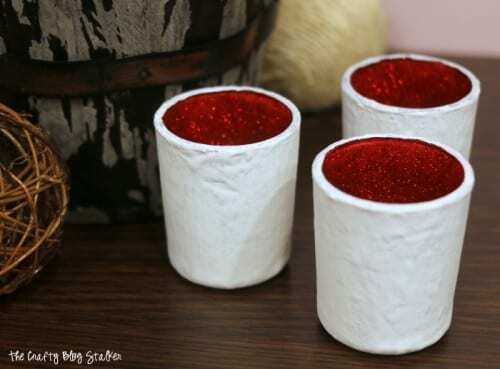 These glitter votive candle holders could be used for any type of event centerpiece, and they would be perfect for weddings! You can also customize and use any color of glitter to match your theme or home decor. How do you like to add glitter to your decor? Share and leave a comment below! 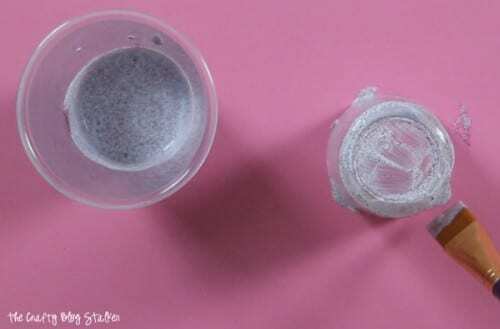 SAVE HOW TO MAKE PAINTED GLITTER VOTIVE CANDLE HOLDERS TO YOUR FAVORITE DIY PINTEREST BOARD! A very cool idea! I like this gesso, I’ll have to keep my eyes opened for it. Katie, they are cool!! Have a great day ahead! Greetings from Dubai!! Such a cool idea that I haven’t thought of before! Your video was great! Thanks for linking up at the Let’s Be Friends Blog Hop! Those are too cute!! Thank you for sharing this at my craft party! I just pinned your entries. Hope to see you again this Thursday at 7pm EST.!! Love this idea! great job the final product turned out amazing! Thank you so much Heather! It was a fun little craft too! Wow! I’ve never used gesso before but, I really like how you used it and the sparkling shimmer once the candle is lit, is just beautiful! Thank you for sharing this with us at Funtastic Friday! Thank you Angie. It was a fun project to create. I am so glad that you like it!